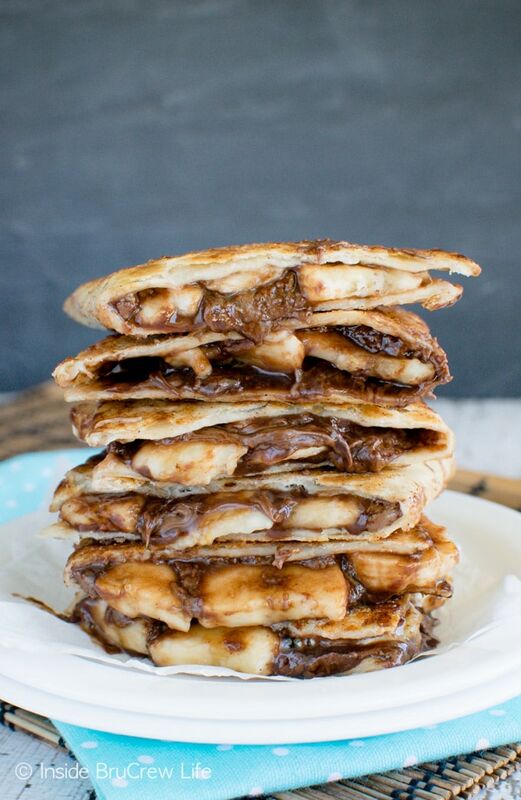 These Banana Nutella Quesadillas are full of chocolate and banana goodness. The buttery cinnamon sugar crust on the outside of each tortilla adds a nice crunch to this easy dessert. Hhhmmmm. There is a half empty jar of Nutella sitting in our cupboard right now calling my name. What should I do with it? Well, other than just eat it by the spoonfuls. But who does that? Cough, cough. 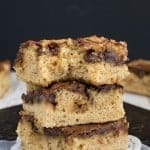 Maybe I should make some more Cheesecake Nutella Twists or another pan of these Banana Nutella Blonde Brownies to celebrate World Nutella Day! Who knew that was even a thing?!?!?! Or we could make dessert quesadillas! 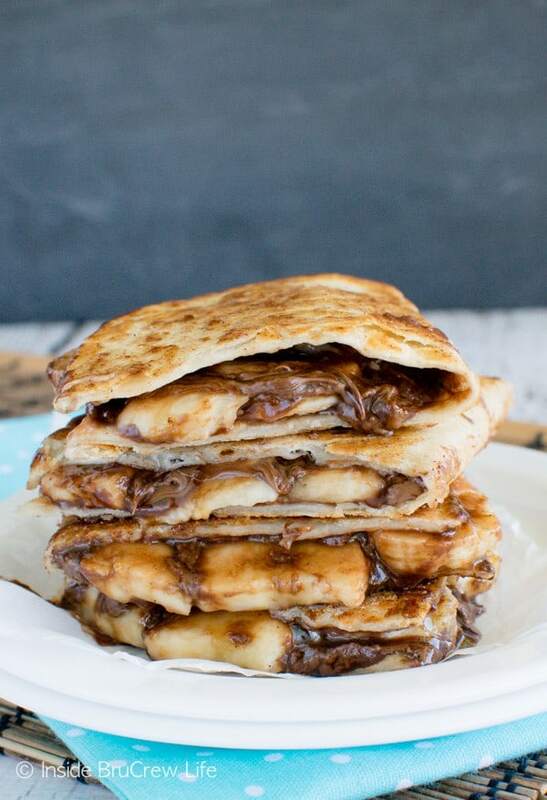 Warm, ooeeyyy, goooeeeyyy, dessert quesadillas filled with banana slices and Nutella. I mean, that’s the only logical thing to do, right? My husband and I took a trip to St. Maarten years ago, and I ate Nutella crepes every single morning. It was absolutely fabulous! I’m feeling the urge to visit there again. But until then these easy pan fried dessert tortillas will have to do. Somehow I have created full-blown snack monsters in our kids! They can eat a full plate of food at dinner, and then they turn around and say they are hungry for a snack an hour later. Now don’t get me wrong. We don’t let them eat a snack every single night. Maybe just every other night. LOL! Most nights we just let them have a bowl of cereal and milk or a bag of popcorn before they head off to their beds. But sometimes a delicious, gooey treat is fun to do! This is such a quick and easy dessert that tastes amazing! Plus, your kids will think you are the coolest mom ever if you let them have bananas and Nutella before bed. True story! Butter one side of the tortillas and sprinkle them with cinnamon sugar. 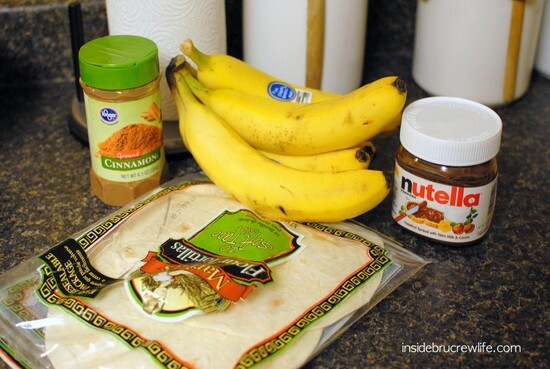 Spread Nutella on the other side of the tortillas and place banana slices on half. Fold the tortillas in half and place in the warm skillet. Fry each side until golden brown. Cut each tortilla in half and serve right away. A little scoop of Cool Whip adds a fun touch to the dessert plate. Just saying. The hidden chocolate center in these Coconut Nutella Cookies is a delicious surprise when you bite into the soft cookie. 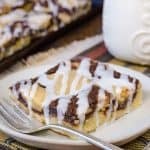 A chocolate and marshmallow center gives these Nutella Marshmallow Bars a gooey flair that everyone loves. This Nutella Popcorn is the perfect movie night snack. You won’t be able to resist eating this sweet and salty treat loaded with colorful candies. Fill your freezer with a batch of these easy Nutella Cool Whip Popsicles! Perfect snack any time of day! A thick layer of frosting topped with shredded coconut will make these Coconut Nutella Brownies your new favorite dessert. Trust me. 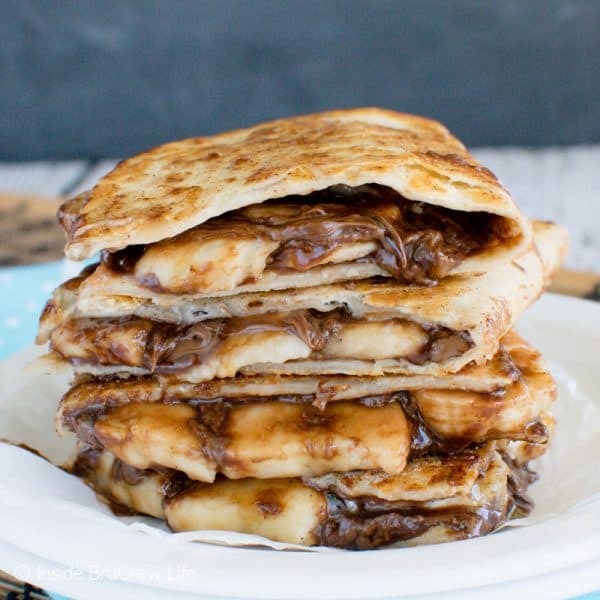 These easy Banana Nutella Quesadillas are full of chocolate and banana goodness. The buttery cinnamon sugar outside adds a little bit extra to this dessert! Spread butter on one side of each of the tortillas, and sprinkle them with cinnamon sugar. Flip the tortillas over and spread the other side with Nutella. Top with banana slices on half of the tortilla. Fold each tortilla in half and place in a warm skillet. Fry each side until golden brown. Cut each tortilla in half and serve right away with Cool Whip, if desired. 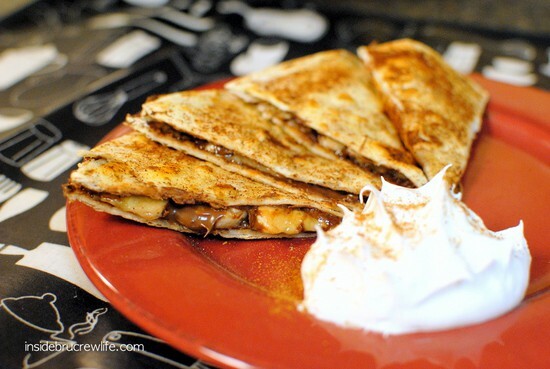 *The post and recipe for these Banana Nutella Quesadillas was first published on January 5, 2011. The pictures and post have been updated and republished February 5, 2019. 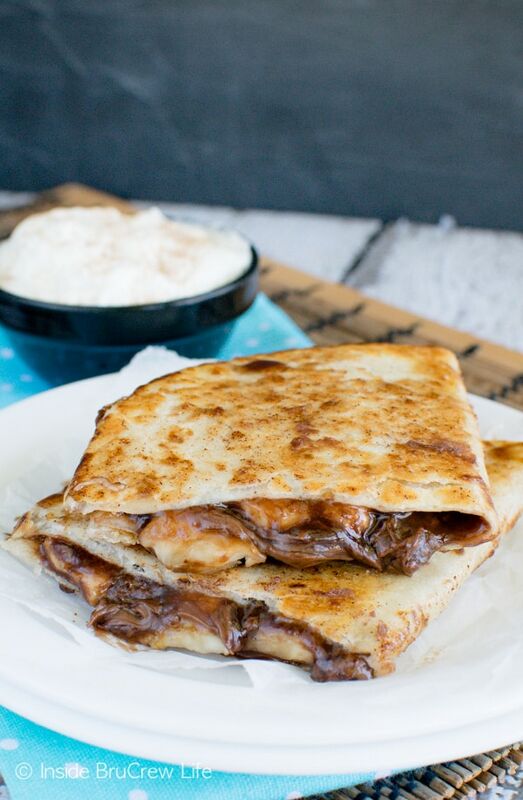 Your Banana Nutella Quesadillas look so good. Thank you for sharing your recipe and have a great day! Those look absolutely to die for!!! I am SO going to make these this weekend! Just wanted to let you know that I am starting a new linky party called “Fun w/Food Friday”. I would love it if you came by and linked this YUMMY recipe up on Friday! Ohhhh you had me at Nutella! Glad I just ran 4.5 miles.. now I can really enjoy some of these! Thanks for sharing the yumminess! YUM! These look fabulous! I’m on a quesadilla fix lately so I need to try these! Sounds yummy! Believe it or not I’ve never tried Nutella, but this may be the first recipe I use it for. And good luck with Crafting with the Stars!! I am adding Nutella to my shopping list right now because those sound absolutely delicious! 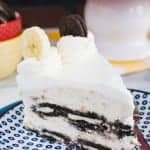 This recipe is so yummy looking, I stumbled it! I know what I’m having for desert today! Those look so freakin good. Dessert for Friday. I was blog hopping and came to your blog! 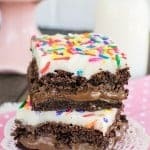 I didn’t make it past the first post cause I have just GOT to try this recipe…not a fan of nutella but it’s got to taste good in that combo!! Also emailing it back home to our old Children’s Pastor’s wife…she loves Nuttella!! Great! Now I’m craving nutella! These look wonderful! I’m your newest follower from the Penny Pinching Party. Would love to have you stop by my site and even join my Tip Day Thursday Carnival (it goes up late Wed nights). I so wish I had one of those RIGHT now! gotta get me some Nutella!! Wow, this sounds awesome. I love Nutella! I may need to try this soon! I have a half a bottle in the pantry too, great idea! WE do this with honey, PB and bananas and roll them up and call them banana burritos, my kids had them for breakfast this morning. Yummy! Looks super de-lish. Just bought some nutella today, I’ll have to try it. Seriously… I would love to go straight to the store grab some stuff and go home to make this. I am so hungry right now and I could probably eat a jar of Nutella. This looks so delish! I will have to try this out on the family next time they are all over. Thank you for linking this! DANG!!!! I heart Nutella! New rule for me, I am not allowed to read your blog when I am hungry. You are going to make me crash my diet! hahaha Jocelyn this is genious! Yummy, yummy, yummy! Those looks delicious! Thanks for linking up again! Yum! So not coming back until I am no longer on a diet! LOL Thanks for linking up! Holy moly, that looks AMAZING. I might have to try these for my sunday brunch! 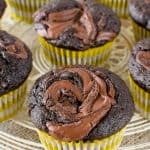 Oh, these look beyond delish!!! Bookmarking it to try with the fam. TFS and Happy 2011! These look so tasty! Very creative too! Oh my! 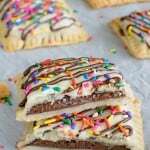 I just have to make these tomorrow, they contain fruit, so they must be good for you! Made these for my kids for lunch. They loved them! Thanks for the idea! Yummalicious! Thanks for making me HUNGRY! : ) My kids are snack monsters too, so this is perfect. YUMMO!!! I have to try these…Thanks for linking up to Mad Skills Monday! Please feel free to snag my I was Featured button for your blog! Thanks and hope to see more inspiration from you soon! Thanks for linking up to Socialize with me Monday til Sunday! Yup, I know that I am having for dessert tonight. I have everything for this and I am ready! Hi! I would love to make these! Do you have a printable version?? yes!!!!! I love the combo on a grilled sammy too. It’s on my blog, but this, this is even better!! I used to live in France. Crepes were everywhere. They aren’t as accessible here in the US, but tortillas are. Love these classic and yummy combo flavors. YUM! This looks like an easy sweet treat! Thanks! My kids would devour these! I can’t wait to make them! Oh goodness, I’m totally drooling. I almost always have these ingredients on hand, so this would be a perfect last minute dessert. Can’t wait to make these! My girls will love these. Great as a snack, breakfast or dessert. I’m pretty sure I used an 8 inch tortilla, but…it could have been a 6 inch. Honestly, you can do any size. My kind of quesadilla!! LOVE the flavors in this!